Areldil is a mildly arrogant Altmer nightblade residing in the fashionable Talos Plaza District of the Imperial City. Compared to most Imperial City citizens, Areldil’s circadian rhythm is slightly unusual and he spends his evenings, from 6pm until midnight, sleeping in his private quarters. On all normal weekdays (Morndas to Fredas) he will, after waking up, venture out into the night and find himself a spot right between the Foaming Flask and the entrance to the Northwest Watch Tower and spend six hours there. He returns to his house at 6am and eats a two-hour breakfast on the ground floor. At 8am he travels to the Waterfront District and strolls around near the Marie Elena until his bedtime at 6pm, only interrupted by a two-hour lunch at noon, which he will take at the Bloated Float Inn. On Loredas and Sundas, Areldil will cancel all his outdoor activities, including his lunch at the Bloated Float, and relax on the ground floor of his house, eating breakfast and sleeping at the usual times. 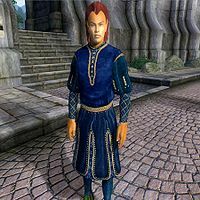 As to be expected from an Altmer of his status, his wardrobe is pure upper class and includes a blue velvet outfit and green velvet shoes. He carries a spare red velvet garment, his house key and a huge sum of gold. He can also cast a set of leveled spells. Although he spends most of the day walking amongst the poor people on the Waterfront, he will give you a typical upper-class rejection when you approach him: "Areldil. We don't have any business, do we? Then, perhaps, will you excuse me?" If you ask him about the Imperial City, you will face yet another rejection, no matter how much you raise his disposition: "I'm not in the habit of answering questions for strangers. No offense intended." While he does not offer any services (see notes), the citizens of the Imperial City can often be heard talking about Areldil's knowledge of locks: "I understand Areldil is good at getting into places other people can't." and "Do you know Areldil? I understand he has some unique skills." Some citizens will comment on Areldil's advanced level of ability: "He's forgotten more about picking locks than most people will ever know. ", "If he'll train you in picking locks, you're probably already pretty good at it. ", "I've heard there's no one in the city better at opening locks." and "He can teach you how to steal the boot right off a lich." Although Areldil's AI package is set to offer services while he wanders the Waterfront, no services were included. It is probable that he was supposed to be a Security trainer because of the rumors about him. Esta página foi modificada pela última vez à(s) 18h21min de 3 de abril de 2015.